Dances characterized by minimalist repetitive movement and dancing automatons moving through space generally don’t interest me. I often find such dances, whatever the purity of the artistic intent might be, however speedy the pace and however well executed, to be deadly dull. 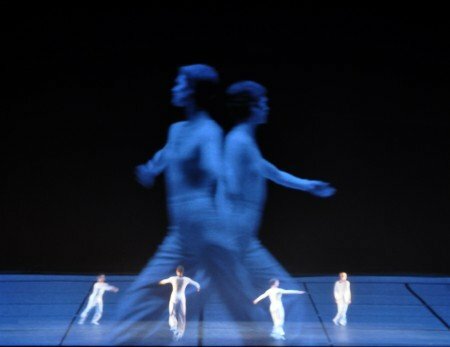 Lucinda Childs, a pioneer of post-modern dance for over 50 years, creates dances characterized by minimalist repetitive movement and dancing automatons moving through space. I should have disliked the retrospective programs of her work presented at the Joyce Theater over the past two weeks. I didn’t. On the contrary, except for an initial experimental piece created before she founded her own company in 1973, I liked them. A lot. These are extraordinary pieces that stand on their own, but that also anticipate choreographic trends not only in contemporary dance, but in ballet as well. Moreover, seeing the development of Childs’s choreography over time (at least as evidenced in these programs) shows that she’s still as capable a choreographer as ever, and that whatever orthodoxy there was has been tempered over the years to make her dances more than academic curiosities. The retrospective was presented in two programs: one traced Childs’s choreographic development chronologically from 1963 until 2016, the other focused solely on her masterpiece – one of them at least – called Dance. The latter, created in 1979, fits neatly within its chronological sequence. But because it’s particularly special, I’ll address it here in the program sequence in which it was presented. In the early 1960s, the Judson Memorial Church in Greenwich Village was one of the more radical avant-garde focal points of the movement in dance that came to be called “postmodern.” The Judson Dance Theater, which performed there, was an informal collective of artists – dancers, choreographers, composers, and visual artists – whose goal was to free dance from the constraints of modern dance technique and structure. Any movement qualified as a dance, and anyone, with or without training, could be a dancer – the goal being to convey the beauty of ordinary movement and the pureness of dance/performance art. Entertainment, indeed, the existence of an audience, was essentially irrelevant. The Judson Dance Theater put on its first show in 1962; Childs joined in 1963, and in addition to performing, began choreographing. In all, she created 13 dances for Judson Dance Theater, and subsequent to her formation of her own company, 50 more – and growing. In addition, she’s choreographed for many contemporary dance, ballet, and opera companies around the world. The retrospective provides a crash course on the development of a choreographer of indisputable achievement and impact. Childs’s first choreographed dance, Pastime, shows most directly the influence of the Judson Dance Theater ambiance and orthodoxy. It’s a dance in the sense that bodies, or parts of them, move in space, but that’s about it. To annoying “music” by Philip Corner that sounds like the screech of braking train wheels, Childs divides the piece into three segments, each featuring one movement sequence. In the first, Caitlin Scranton balances on one leg. In the second, Katherine Helen Fisher is encased in a white cocoon-like fabric (the form, with Fisher leaning up from the stage floor, looks somewhat like a bathtub), from which she drapes a leg and flexes a foot back and forth and back and forth, as if lamenting the absence of a point. The third has Anne Lewis standing upstage left facing the theater’s bare back wall, bent at the waist such that the only parts of her that were clearly visible were the backs of her legs and her derriere. Occasionally, all the dancers would change positions, minimally, but the basic movement quality remained. It was deadly – but I suppose in context it fulfilled the choreographer’s intent. Difficult to appreciate as it is beyond marking a stage of development, like learning to crawl, Pastime’s presence in the retrospective also shows that Childs’s artistic vision was not restricted to a particular ascetic artistic attitude. As evidenced by the next three pieces on the program, Katema, Radial Courses, and Interior Drama, Childs’s choreography in the 1970s evolved in a more interesting direction. Each of these dances is a study in minimal repetitive movement, but each is a small gem that transcends repetitive movement as an end in itself. In these three pieces, Childs is the mathematician/physicist, working ingredients like geometry, spatial relationships, timing, speed and mass, and variable repetition into her dances. The result is not at all minimalistic-looking; rather, it becomes akin to the movement of celestial bodies in space, concurrently predictable and unpredictable, fascinating, and beautiful. These dances are created without musical accompaniment, noisy or otherwise, of any sort – just the sound of the dancers’ feet hitting the floor and the whirr as their bodies cut through space. 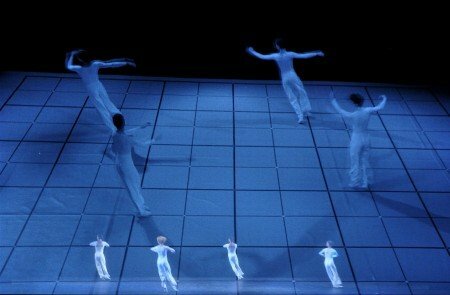 In the earliest of the three chronologically, Radial Courses, four men, paired and costumed minimally in white, circumnavigate the stage counter-clockwise for most of the piece. The pairs walk together at a rapid pace, separated by half a body length. As the dance progresses, the men change positions, or one speeds the tempo of his gait to maintain his position while accounting for differences in his circumference compared to his paired partner, or, in mid-course, one man will jump up, turn around, and then resume his movement pattern. These variations are repeated periodically, or “transferred” to another of the four men. Occasionally the pairs will change places, or movement components, or the walking/running circular progression will change direction or be limited spatially as if the stage is separated into four component quadrants. You know there’s a rhyme or reason to the changed movement based on counts or spatial relationships, but the speed of the piece makes deciphering the “code” impossible – and the “why” doesn’t matter as much as the knowledge thatthese choreographic mutations will happen with seeming unpredictability. The same is true of Interior Drama and Katema, except these dances are populated by five and four women respectively, and the spatial divisions and choreographic “steps” are different. Essentially, the women, also costumed in white, divide the stage into sections, dance within the sections or cross into other sections, or leave the stage entirely though the wings only to return. And most importantly, there’s a change in the movement quality. It’s still repetitive, but there’s a greater variety of “steps”. These pieces, all of which were presented during the first half of the first Joyce program, are mesmerizing. And then in the program’s second half, one sees that Childs thereafter proceeded to create dances that are not only mesmerizing, but thoroughly entertaining. 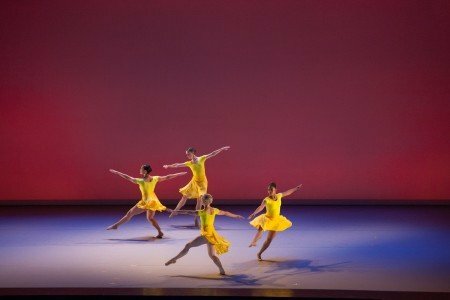 Concerto, created in 1993, is a complex, dramatic piece that produces a different visual impression from the dances that preceded it on the program. For one, it’s dark – visually because of the black costumes, and musically arising from the accompanying score, Concerto for Harpsichord and String Orchestra by Henryk Gorecki, but also in its complexity. It’s still essentially all repetition, with variety as in the prior pieces, and geometric patterning. But to my eye Concerto takes Childs’s choreography to a new level of modulation and phrasing, and, to some extent, incorporation of balletic sensibility. It might be considered minimalism, but only in the sense that at any given time the choreographic palette is limited. Stage designs appear and disappear as if by magic; movement directions change in an instant; a greater variety of visual shapes as the bodies move through space, and although the bodies are still rigid and faces emotionless, I saw fluidity and grace. The next piece on the program, Lollapalooza, choreographed in 2010, is only an excerpt (from the section choreographed to John Adams’s Son of Chamber Symphony, Third Movement). This (at least this excerpt) illustrates another choreographic evolution. No longer reliant on the simplicity of black and white, here Childs incorporates color. And partnering. It’s pure joy. And when I saw (or thought I saw) images that brought to mind not only contemporary choreographers like Twyla Tharp, but Balanchine and Petipa, I nearly burst a blood vessel. It’s the kind of piece….sigh, excerpt….that makes one want to stand and cheer. Last year’s Canto Ostinato, to Simeon ten Holt’s composition of the same name, is yet another marvelously intricate and dramatic piece. And this year’s Into View, which premiered at UCLA only a few weeks ago (a co-commission of the Center for the Art of Performance at UCLA and the Joyce Theater Foundation), in many ways is similar to the Lollapalooza excerpt. It’s just as colorful; just as joyful. 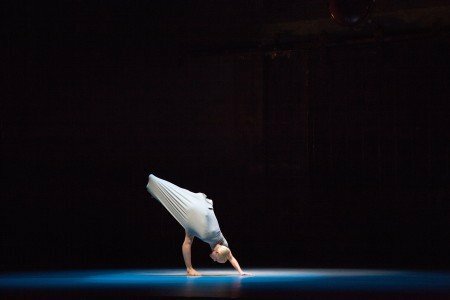 I had anticipated that Dance, the piece on Childs’s second program at the Joyce, would be the link connecting the first half of the retrospective program to the second. It wasn’t exactly, but it does demonstrate a continuing and significant artistic progression. Created in 1979, Dance, which is comprised of three separate but related twenty-minute dances separated only by brief pauses, takes the visual choreographic ingredients in the three earlier pieces presented in the retrospective, adds music by Philip Glass and film by Sol LeWitt, and expands the presentation into a work of art that transcends movement as an end in itself and becomes almost cosmic in effect – and significance. 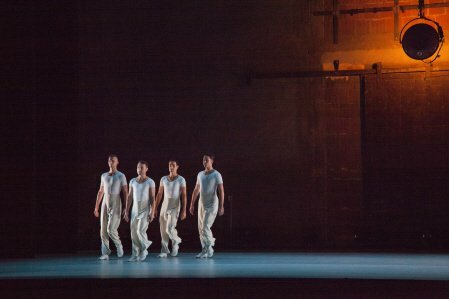 In the first of the three, ten dancers continuously traverse the stage horizontally, at times entering from stage right, at others from stage left, exiting into the opposite wings. 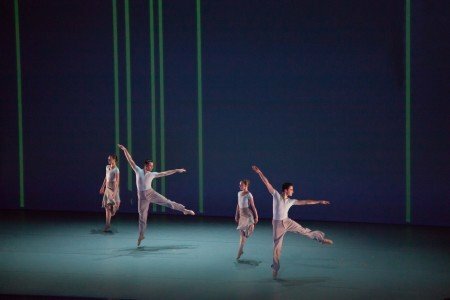 While moving in pairs, the dancers maintain their positions in invisible horizontal “lanes,” at the beginning dancing Childs’s combinations in sync, and later changing the minimal choreographic vocabulary and adding mutations while remaining synchronized. As this is happening (and as the Glass score similarly changes and mutates within a minimal and repetitive sonic range), LeWitt’s films are projected onto the downstage scrim visually (to the audience) penetrating the actual performing space. At times the films just impose a pattern onto the actual stage floor or project the filmed floor at different angles or in a space above the actual dancers. But primarily, and most significantly, the films (while repeatedly shifting from a wide to a close-up view of the projected dancers) show the same choreography executed by a different set of dancers (presumably the original 1979 cast, but that’s not indicated), making the “live” dancers appear not only to be dancing in sync with each other, but with the projected dancers. 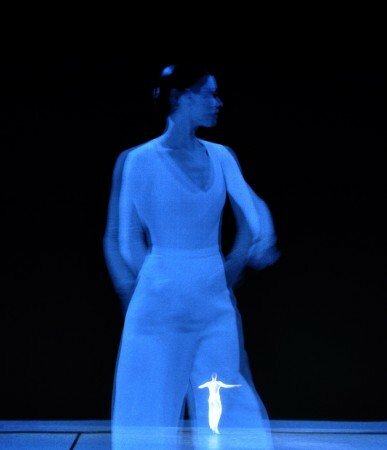 Dance II is a solo, which begins with a filmed projection of Childs standing still as the Glass score is performed (it’s remarkable how little Childs has changed physically over the years). Eventually she starts moving, and Caitlin Scranton, live, visually appears to accompany her – or maybe Childs is “accompanying” Scranton. Regardless, Scranton and the Childs image move circularly around the stage or lineally down the middle upstage to downstage, and there are variations and mutations evident as the dance progresses. Dance III expands the stage boundaries in Dance I, with eight dancers not only moving horizontally, but diagonally, vertically, or in quadrants. And here, the LeWitt film expands its boundaries as well, utilizing split screens to provide different views of the same scene. 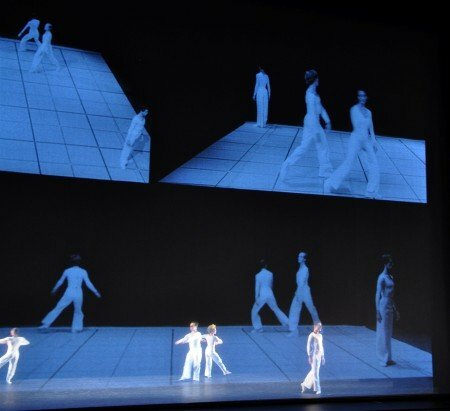 For example, if one sequence has four dancers (two pairs), the split screen projection (they may be separate projections shown concurrently) might separate the same sequence so the projection provides different viewpoints – and at one point I thought I saw the split projections showing front and back views simultaneously. All this variety of film projection angles and images occurs while the live dancers perform on stage in sync with the projected dances, but at the same time oblivious to them. And it’s all done at near breakneck speed. The effect of all this is astonishing. The process adds multiple dimensions of reality to the visual presentation, and a timeless quality as one temporal period merges with another. 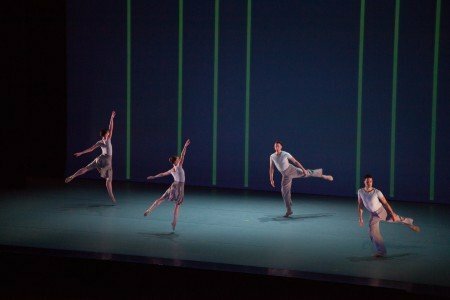 Consequently, “reality,” from an audience point of view (and a critical factor here is that this is done for the benefit of the viewing audience), is expanded to the point that it’s unclear whether the projected dancers or the live dancers are the ones seen performing live and in real time. Dance is a postmodern masterpiece that transcends its stylistic label. It’s also one of those rare abstract dances that picks the audience up with its kinetic energy, draws them in, and never lets go – just by the movement quality and reality blurring alone. When the program ended, I was out of breath – and certain members of the audience at the performance I saw couldn’t limit themselves to bravos or whoops; I heard “wow!” and “that was incredible!” shouted as if in awe and disbelief. A final observation. One of Judson Dance Theater’s precepts was that no special training was needed; that anyone could/should dance. That’s not the case with this company. They’re all superbly trained dancers. Other than those who could be singled out because they performed in solos, I haven’t mentioned any of them specifically because the choreography they danced to and executed so well was essentially identical for all of them. But they’re not moving mannequins, and each member of the company merits effusive praise. Most are identified in the attached photo captions. As I stated at the outset of this review, my usual reaction to dances that rely on minimalist repetitive movement and dancing automatons moving through space is, at best, indifference. The dances created by Lucinda Childs presented in this retrospective show how complex and exciting this process can be. I’m grateful for the opportunity to have seen them. Dance continues at the Joyce though December 11, and I urge anyone interested in dance to see it.